Perhaps I’m not as cynic as I think I am because reading that Hillary Clinton, the US secretary of State expressed her and the US administrations worries for the defence cuts the UK government is planning I got a bit angry. And naturally my mind straight away gone on how much those very same expenses have cost to Greece the last decades and what is their share for the financial situation in Greece today. First of all by expressing he worries Ms Clinton and I repeat the US secretary of State interfered with a UK domestic issue far from her job description and in general a foreign minister’s job description. As I understand it the foreign minister is there to defend and promote the country’s interests suing diplomacy as main weapon. But I suppose this were my cynic part failed, I suppose it is partly semantics but if we widen the thought perhaps foreign ministers include in their country’s interests also the interests of private companies. Because in the years of recession when countries like UK - countries that enjoyed for centuries the wealth and power of the major players in the international scene – feel that is time for some shavings. When the Queen cancels her Christmas gala because she feels the economic problems it is too much to ask money, billions of Euros and pounds to spend in weaponry and NATO. I have a good reason to involve NATO in these thoughts since the last few years here in Finland more and more it comes in conversation and especially from generals and army specialists the argument that Finland should join NATO. NATO should be dead, the moment the Berlin wall fell somebody in Brussels – the headquarters of this militaristic organization – should have said “mission accomplished” and the last to lock the doors. But instead of that they continued keeping active an organization with no real target who should be actually disarmed for the simple reason that the work they try to do is already registered to the UN. Except that NATO existence boycotts any chances for the European army and the European defence system which makes far more sense than the NATO and it can include all the European countries who already try to combine economic and foreign policy. NATO is a huge weapons supermarket with only providers the American arm industry, period. And Hillary Clinton the US secretary of State – I repeat her title in a case we missed it – is acting like a salesman for the interest of Lockheed, Boeing and I don’t know what other arm industry. Actually I find it extremely arrogant that accompanied from the US Defence secretary Robert Gates from NATO’s headquarters in Brussels they even dared to say things like that. The Greek governments the last fifty years have spend mythic amounts of money to buy American guns most of them through NATO with a variety of excuses. After the WWII and five years of civil war Greece was far worst than it is today with thousands of people literally starving. Still the Greek government was spending millions in arms – often second hand tanks and airplanes – for the fear of the Communist neighbours Bulgaria, Yugoslavia Albania. Oddly the real danger never came from the north but a NATO ally but this is a different story. Three decades ago the Greek government bought a hundred of F14 or F16 – I’m not an expert so I’m not sure – spending millions of Euros – it was Drachmas then so it was trillions – while inflation was reaching 15% and unemployment was far over 10%. Even today while education takes 7% of the country’s GDP the defence cheats 7.5%. 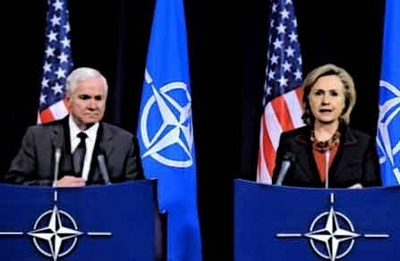 The word cheat is correct since NATO – since they are the main provider of the Greek arm forces – literally cheat the future of the Greek people. Just imagine if for two years Greece would stop dealing with this 7.5%. In two years it would have bring back the necessary balance, the reasoning of all the problems this moment and with another two years it would have helped the country into a financial miracle that would make even Germany turn green. By the way US might be NATO’s main weapons provider but Germany, UK and France have a very rich share. There are thousands of things I disagree with David Cameron but I think his move for defence cuts is very brave, very logic and most of all shows that he puts the British people and their real needs over everything else. As far the US secretary of State my thoughts is that instead of provoking the allies with petit marketing tricks that serve private industrialists she has better to put her efforts to the international peace and serve the interest of the US government abroad smoothing the opinion the majority of the countries have about US foreign policy. “If you want peace prepare for war” said the Romans. Indeed, the Roman army was always busy at some war at some frontier or other, or to squash one rebellion or other for the one thousand year’s duration of the Empire. Paradoxically they called it “Pax Romana.” And so in the name of peace and prosperity and in order to be prepared for war the arms’ race cottage industry was born and eventually institutionalized as Defense Department which is realy a War Department. There is a much better idea and it is a Biblical idea found in Isaiah 2:4 and expressed artistically by a bronze statue by Evgenly Vuchetich donated to the UN in 1959, of all countries, by the Soviet Union. It can be found in the garden of the same United Nations in New York. It shows the majestic figure of a man holding a hammer in one hand and, in the other, a sword which he is transforming into a plowshare, a symbol of man’s desire to put an end to war once and for all and convert expensive destructive means of destructions into creative tools of peace. The question arises: is this a case of art for propaganda or of art giving expression to man’s desire for justice and peace. Indeed the idea is quite simple: if one wants peace, one does not prepare for war but one works for peace. That idea is expressed artistically by another work of art found in the gardens of the UN, this one donated by Japanese children and dubbed The Japanese Peace Bell which is rung at the opening of each General Assembly’s session. It is made of coins. I suppose what the children are reminding us cynical Machiavellian adults is that with the money saved by converting arms into plowshares we could feed all the starving children of the world, and then some. Errata above: if one wants peace one does not prepare for war but one works for justice.